What's Poppin' Tonight! #MokaiWednesdays The #HouseOfHipHop presents Yo Gotti at Mokai Lounge #MokaiMiami ~ Phresh Hott New! Tonight! Enter the #HouseOfHipHip tonight at Mokai Lounge. 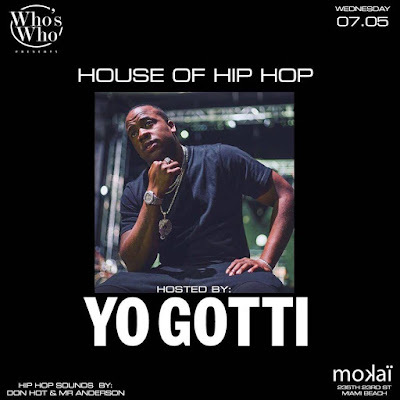 Who’s Who Presents Mokai Wednesdays featuring Yo Gotti and more at Mokai Lounge. Join us for the greatest Hip-Hop party on the beach TONIGHT at Mokai Lounge. Sounds by DJ Don Hot | Mr. Anderson | + More!